Steamed pork with salted fish is a family favourite for me and I’m sure for many Chinese families too. It is a familiar dish for many of us who grew up eating it. The star ingredient here is the salted fish as that’s what gives this dish its unmistakable flavor and fragrance. Although it’s a humble ingredient, you’ll need to get the right type of salted fish as it will make all the difference to this dish. Salted fish is made from many different types of fish but for this dish, only the mui heong variety will do for me. 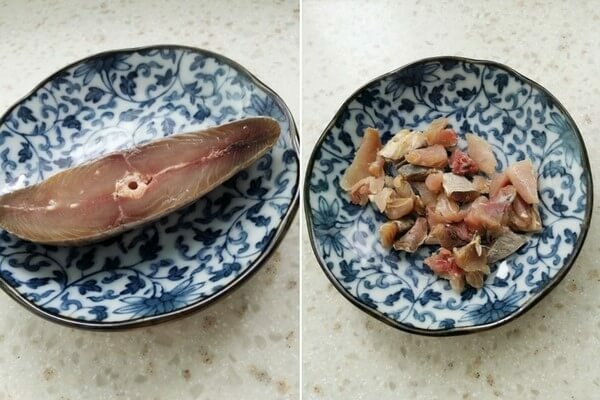 The flesh of mui heong salted fish is soft and moist and the best ones are made of ikan kurau (threadfin). It can also be made of Batang (Spanish Mackeral) and Red Snapper fish. When I was growing up, mui heong salted fish was just like any other salted fish to me. I was unable to discern the difference. It was only in later years that I began to appreciate it as my interest in cooking grew. Originating from Kuantan, East Malaysia, they are more expensive compared to other types of salted fish as they are cleaned, fermented and salted immediately after being hauled from the fishing trawlers. The fermentation process takes around 7-8 days. Thereafter they are sun-dried for about 2 days. What I love about mui heong salted fish is that they are very fragrant and the salty taste is not sharp but gently saltish. As their flesh is soft, keeping them in the freezer makes them firmer and easier to cut. When you fry them, your entire kitchen will be filled with the aroma of the salted fish. This alone can already whet my appetite. You’ll need to serve this dish with rice. And lots of it! The mui heong salted fish shown on top is about 50g and I used half of it for this recipe. I want it to complement the pork. Not overwhelm it. However, you can choose to use more if you wish. Roughly chop it up and fry till fragrant. Keep a close watch as it burns easily. Once fragrant, remove from the pan and set aside. They are usually available at the wet market Chinese provision shops. I prefer to buy from stalls which refrigerate their mui heong salted fish and not those left in the open. They are also sold in bottles if you can’t find the ‘fresh’ ones. Ginger is another essential ingredient in this dish. Salted fish and ginger pairs together beautifully. Also, use fresh pork as far as possible. You’ll taste the difference. I bought mine from the wet market. Tell the butcher that you want pork with a little fat and to grind it coarsely. If you’re concerned about the fat content, you can use lean pork too but the dish will not be as flavorful. I’ve tried cooking this dish using lean pork before and it turned out dry and sad so from then on, I’ve always used pork with fatty bits. A little fat goes a long way to create a juicier and softer meat patty. 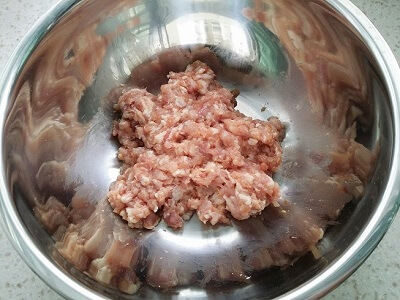 In a large bowl, add in salt and corn flour into the pork mixture and mix well with your hands or a pair of chopsticks. Then lift up the pork and throw it into the bowl for about 10-20 times. This procedure will make the meat sticky and produce a chewier meat texture when it is cooked. Then add all your marinade ingredients and half of the fried salted fish into the meat and mix everything thoroughly. Spread out the pork evenly on a heatproof plate. Use the back of a spoon to pat down the meat. Top with finely sliced ginger and the remaining fried salted fish. 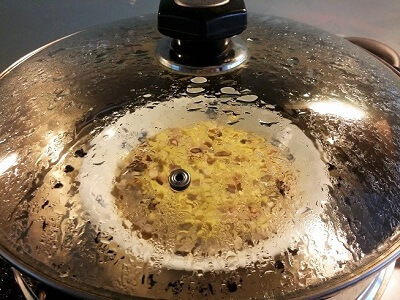 Place a steaming rack on inside a large wok. Fill with about 1/4 full of water and bring it to a boil. Once the water is boiling rapidly, place your heatproof dish on the steaming rack. Put the lid back on and steam for about 10 minutes until the pork is cooked through. 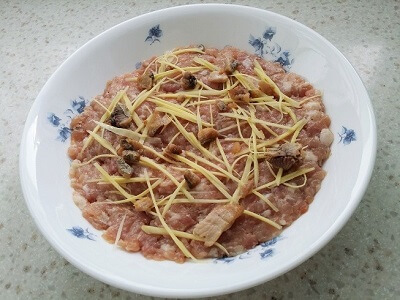 Steamed Minced Pork with Salted Fish. Extremely tasty and easy to prepare, it is so easy to love this dish. A family favourite and a crowd pleaser. Pair this with a soup and veggie dish to complete your meal. 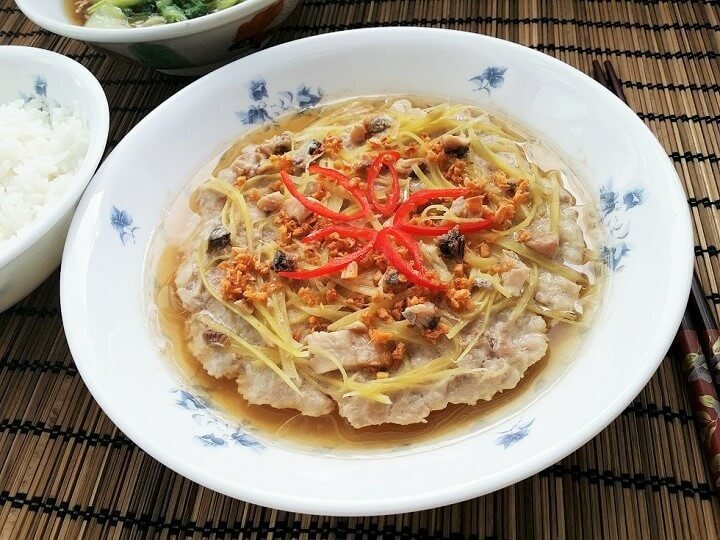 A delicious and appetizing steamed pork patty with mui heong salted fish. In a large bowl, add salt and corn flour into the pork mixture and mix well with your hands or a pair of chopsticks. Lift up the mixture and throw it into bowl 10-20 times so that it will be more 'springy'. Add the rest of the marinade ingredients into the meat and mix well. Set aside. Heat up oil in a frying pan. Fry the salted fish pieces until fragrant. Add half of the fried salted fish into the pork mixture and mix well. Arrange the pork into a heatproof plate and press it down with the back of a spoon to smoothen it. Add the finely sliced ginger and remaining fried salted fish on top of the pork. Fill a wok with about ¼ full of water, place your steaming rack in and bring it to a boil. Once the water starts boiling, place the pork dish on top of the rack. Close the cover and steam for about 10 minutes until the pork is completely cooked. Remove carefully from heat. Garnish with sliced chillies and drizzle with garlic oil and fried garlic bits. Serve immediately with plain rice. 1. Wear a pair of disposable plastic gloves if you do not wish to handle the raw pork with your bare hands. 2. Fresh pork is preferred over frozen pork for this recipe. 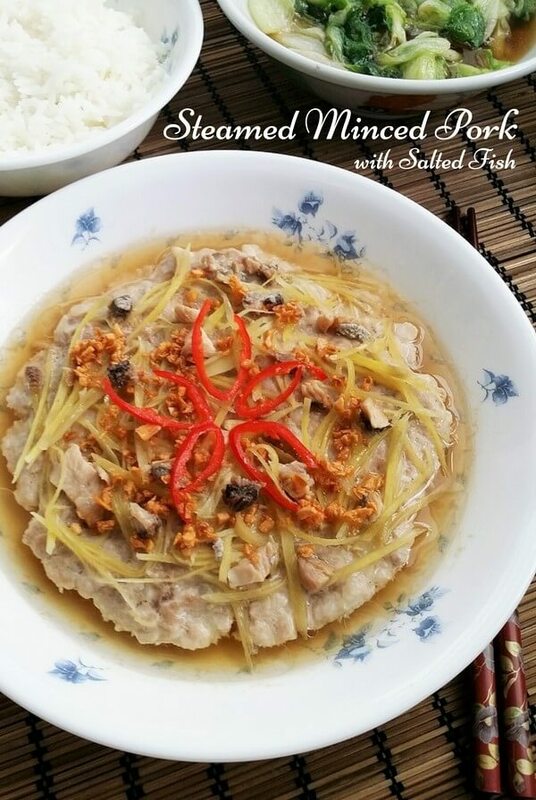 Steamed Pork with salted Fish is certainly a new and different recipe for me but one that sounds really amazing to eat. Mui Heong fish sounds great when combined with the minced pork, and the end dish certainly makes me feel hungry. Thanks ever so much for your cooking instructions because this is one recipe I will definitely try for myself. I don’t know what mui heong salted fish is. Do you have any English name for it? The fish looks like tuna, though. In Indonesia, we have so many types of salted fish. I think I will use this recipe with a soft salted fish I can find. All your recipe looks so easy. I think I will try them one by one. Thank you. Thanks for writing in and your question. I’m not sure what mui heong salted fish is called in English. This type of salted fish is soft and moist unlike the hard ones. You can tell by pressing it. Whenever I purchase it, I will tell the seller that I want ‘mui heong’ salted fish and he’ll know which one to give me. Hope you’ll enjoy the recipes and happy cooking! I eat a lot of Asian food, but I’ve really only tried recipes using pork and prawns, so this would be nice to try. I’m sure they would have the dried fish in the Asian supermarkets at China town here, but it’s close to an hour’s drive for me. If you can’t easily get the ready-bought option, I’m wondering if you’ve ever tried drying your own fish? I’ve seen it done, where they salt it and put it into a jar, but I’ve always felt nervous about trying it. Welcome to my blog! I don’t dry my own fish as it’s much easier to just buy the salted fish from an Asian store. Mui heong salted fish is also available in the bottled form if you can’t find the fresh ones. You may wish to see this post for more information on how to make your own salted fish. This is one of the Chinese home food that I always have at home. The minced pork with salted fish is one of my choice. The salted fish is one of the key ingredient to go with the meat. For me, I always add a lot of the salted fish to give it a better taste. Spread the mince meat evenly and add the dry salted fish with bits of ginger and steam it for roughly minutes and it’s good to go. This is something that I always have at home too. Simple and delicious, it is a favourite in many Chinese households. I don’t like to use too much of the salted fish. Just enough to flavor the pork.